I have hands down found my new favorite breakfast smoothie! It honestly is like ice cream for breakfast. Delicious, chocolatey, sweet, creamy ice cream! I used my handy dandy Oster MyBlend Blender again. It has one frozen banana (cut in half to blend better), 1/3 scoop chocolate protein powder, 1.5 tsp peanut butter, and 1/2 cup vanilla unsweetened almond breeze. This honestly is even better than I expected it to be. 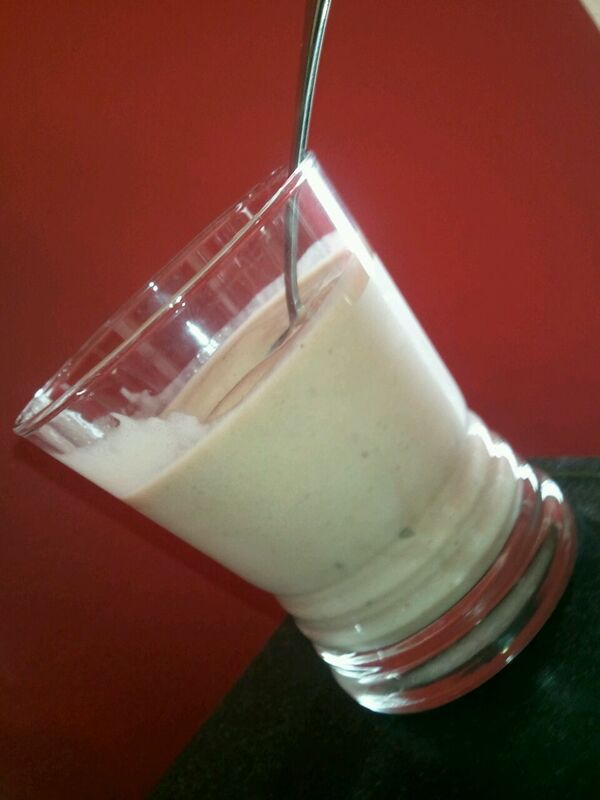 It is so creamy it’s much more like a milkshake than a smoothie! Add one block of protein and you have a perfect 3 block breakfast for those of you in the Zone. Again, for those who don’t follow the Zone, this smoothie comes out at: 210 Calories, 6.5g fat, 33g carbs, and 12g protein. Yum, Yum, Yum! Hope you guys enjoy it as much as I did!